On the face of it, things might appear to be business as usual. According to Phocuswright's just-released travel research report, U.K. Online Travel Overview 2018, the country's travel market is poised to grow 3% in 2018, bringing gross travel bookings to £49.3 billion. And additional growth of nearly 4% is expected in 2019. But with the March 2019 Brexit deadline looming, making projections about the long-term prospects for the U.K. travel industry can get a bit dicey. More than two years after the historic referendum to leave the European Union, the outcome of negotiations with EU member states is still unknown. A so-called "hard Brexit," in which the U.K. departs the EU without a new trade agreement in place, poses a major threat to the British travel industry, including all verticals. For consumers, there's a risk of losing the benefits of free travel between the U.K. and the EU, liberal tax and border policies, and benefits like access to medical treatment and mobile roaming while traveling across Europe. 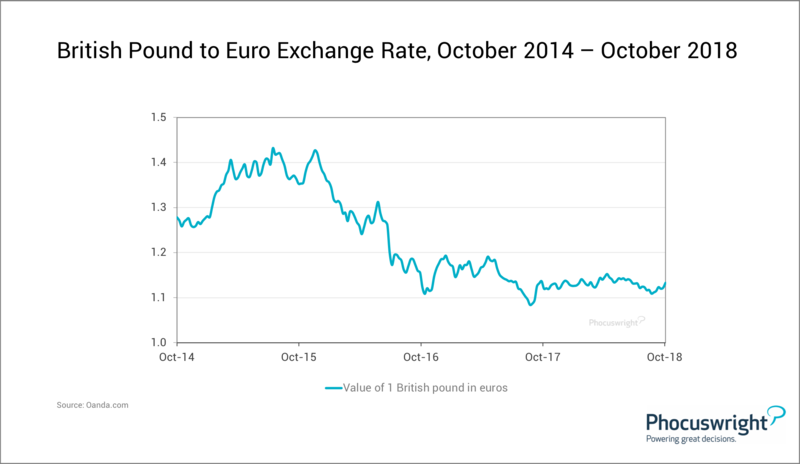 And perhaps most importantly, the value of the British pound has fallen significantly. 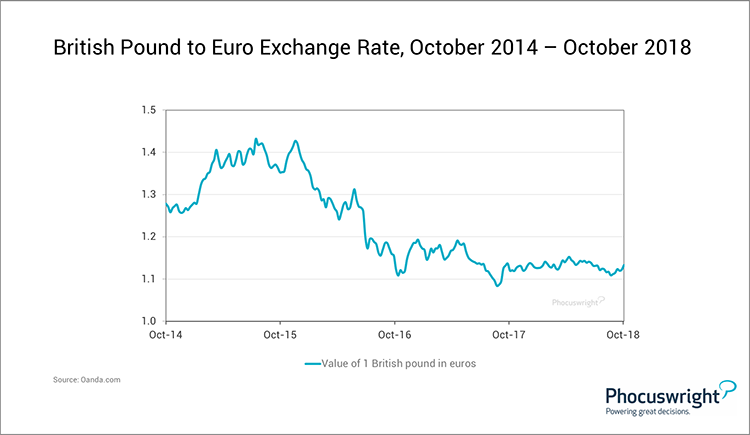 Prior to the U.K.'s vote to leave the EU, the pound was worth €1.40 but has since fallen to a low of 1.10 against the euro, as well as a long-term low against the U.S. dollar. As a result, British spending power for outbound travel has fallen. Of course, Brexit is not just a threat for consumers. Fears are probably greatest at pan-European companies such as TUI, Thomas Cook, IAG Group or easyJet, which risk losing access to the European Common Aviation Area (ECAA), with far-reaching implications for flight operations and rights within Europe. In the hard Brexit scenario, U.K. carriers would require pan-European air operator certificates (AOC), potentially spurring new operational units outside the U.K. Nearly every airline in the U.K. is preparing to register licenses and initiate flight operations in countries within the European Union. For both corporate and leisure travel, the risk that Britons will be required to pay visa fees for trips to the European Union may result in a further dip in outbound travel. Hotels also face the prospect of staffing challenges, with a substantial share of U.K. hospitality industry workers considering leaving the country as a direct result of Brexit. And Brexit will impact the 27 remaining member states of the EU. According to the Office for National Statistics, U.K. outbound tourists took 72.8 million trips abroad in 2017, and British tourists spent £25 billion in Europe alone in 2016. In light of these factors, it's notable that Phocuswright's U.K. Online Travel Overview 2018 still projects modest growth for the country's travel industry. But whatever happens before and after March 2019, this much is clear: the world's fifth largest travel market (and a leader in the online travel category) will remain a critical contributor to the global travel and tourism sector. In terms of how the country's travel market weathers the approaching Brexit storm, however, that story that has yet to play out. For more insights into the potential impact of Brexit and the dynamic state of the U.K. travel market, check out Phocuswright's U.K. Online Travel Overview 2018. Gain access to Phocuswright's full research library with your Open Access subscription. Not a subscriber? Learn more here.